Is Birmingham the Gastro-Capital of the UK? No is the short answer. BBC Olive Magazine however, would beg to differ. In November’s edition of the mag, they pitted Birmingham against 6 other destinations (London, Edinburgh, Ramsbottom, Ludlow, Melton Mowbray, and Abergavenny) to find out ‘who’s the foodiest of them all?’. 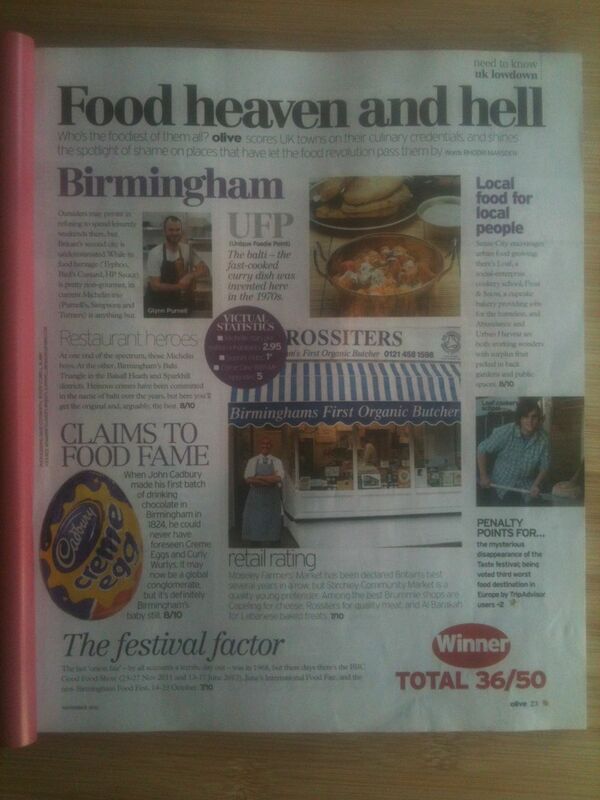 Birmingham came out top with 36 points out of 50 after adding up categories such as restaurant heroes (Balti’s, Glynn Purnell etc), local food (Loaf, Frost and Snow, other social enterprises etc), retail (Rossiters, Capeling, farmers markets etc), claims to fame (Cadbury’s), and the festival factor (Onion Fair, BBC-ahem-good food show, Birmingham Food Fest). Quite how they came up with the short-list I don’t know but I’m sure there are quite a few aggrieved town’s and cities out there (Liverpool, Bristol, Padstow, Cartmel, Oxford, Bray etc). Although I welcome the publicity for my adopted city, and agree with most of the things the article praises, I just can’t agree that Birmingham can possibly be crowned the culinary capital of the UK right now. If the award was for most improved, I think Birmingham would rightly be in the running, it’s seen a huge change in food culture in the eleven years that I’ve been in the city. But really, our food culture is only beginning, it’s a babbling baby in comparison to some of the other destinations mentioned. I actually supplied quite a lot of the information that ended up in the article (see this post), but I never thought in a million years we actually stood a chance of winning. It’s undoubted that the higher end fine dining scene is now fairly well established in the city, thanks to many many years of hard work on the part of characters like Andreas Antona, Richard Turner, Glynn Purnell, and the ever improving output from the College of Food (UCB). There’s signs of life at the grassroots level too from people like us, Sense City, all the various markets, and other food growing initiatives, co-operatives, home-businesses, and social enterprises that are springing up. There’s also a huge existing swathe of decent cheap food shops and markets in parts of the city, particularly those parts populated by Asian, African, and Afro-Caribbean communities, and we do pretty well at the budget-level in terms of restaurants – you can eat out well for very little cash in chinatown, the balti triangle, and again in parts of the city populated by Asian, African, and Afro-Caribbean communities, and in some places in the city centre too. I really believe that the city needs thriving town centre’s that genuinely offer an alternative to supermarket shopping, and where you can get most of what you require within a short walking distance from each other. They clearly work, just go to Soho Rd, Alum Rock Rd, or Stratford Rd and see what a thriving town centre based around food shops looks like. We need high streets in South Birmingham particularly where you can go and get a decent loaf of bread, basics like milk, eggs and proper store-cupboard ingredients, good quality fresh fruit and veg, free range or organic meat, some nice cheese, a decent bottle of wine or some nice beers, and at the end of all that to eat somewhere that cooks good food from fresh ingredients to a decent standard. We need a council who genuinely strive to create thriving town centres too. All too often, the council is willing to usher in major projects (supermarkets) every few years and call them regeneration, when day-to-day, year-to-year small local shops are not being supported enough. We need business rate breaks for start-ups, shop improvement grants, an easier planning system, strategic plans for town centres, town centre managers, council officers researching grants and possible investors in small retail etc etc. I’m sure Birmingham is not the worst when it comes to this, but it certainly has a lot to improve on, and the council seems little concerned with anything outside of the city centre. Even in the city centre they’re threatening to close down and break up the wholesale markets which will be the biggest tragedy to ever hit this city’s food culture in my opinion. We need more risk takers too, there are way too many naysayers around and not enough people willing to put their money where their mouth is. From taking a punt on your local shop, to taking a punt and creating your local shop. If you want a market in your neighbourhood, set one up, it really isn’t that difficult. If you want a proper food festival, get organising one. If you want to set up a microbrewery, get a group together and start writing a business plan. If you need a greengrocer, talk to others about setting up a co-operative. If you want a community garden, talk to your neighbours and get your spade out. You get the idea, be the change you want to see and all that. There are many places to place the blame for the lacking food culture in Birmingham, but we mustn’t sit around waiting for other people to make things happen. There is a long way to go, and much to do, get on it.